RITUALS, the first of three pieces composing KINGDOM COME, is a large projection of aerial footage that has been shot by pigeons equipped with lightweight digital cameras. 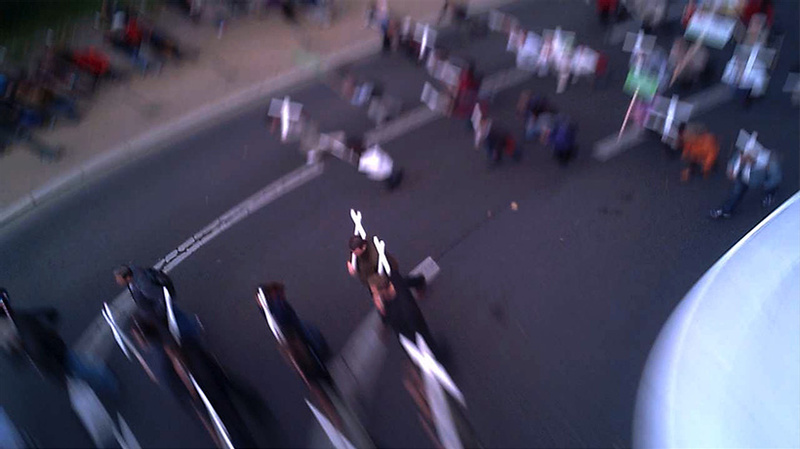 With heavy wind and the nervous flapping of wings, the viewer gets only a fractured impression, though immediately identifiable, of a political demonstration. The signature elements of protest are captured only in glimpses: masses of people moving steadily in the same direction, banners, police, police cars, barriers, etc. The political motivations of the demonstration remain ambiguous as the images primarily highlight the mere shape of political protest. In RITUALS, political protest in public space is reduced, presented as a visually uniform and dramaturgically ritualised movement of bodies. The video’s aesthetics convey a rather painterly or structuralist tone. Between flashes of German flags, the parliament building and the German Chancellery, we can finally make out the protesters carrying white crosses – a hallmark of the annual Christian anti-abortionists’ rally. Nevertheless, from the pigeons’ perspective the rally looks scarcely different than a reproductive rights demonstration. Some questions arise: can the design and shape of a demonstration show differences in ideology or critical perspective? What might other forms of collective political practice in public space look like? While our habits of analysing images lead us to inscribe a gaze or subjectivity upon their ‘creator’, the birds compel us to think differently. We neither see what the pigeons see, nor are the pigeons aware that they are filming. Through the pigeons’ perspectives of multiplicity the animal can no longer be seen either as subject or as subject matter but rather as a medium. The view we get is one of non-participation, an inaccessible anomaly to any form of definition, and following Deleuze and Guattari’s concept of becoming-animal an achievement of non-identity or post-subjectivity. Here the camera and its perspective no longer occupy a realm of stability and identity, but rather they fold into movement and a restless mode of existence. This is the precise perspective RITUALS wants to experiment with when looking at the space and surroundings of what signifies the German political centre, at political geography, participatory democracy and urban landscapes of power. KINGDOM COME was initiated by the artists’ discovery of pigeon photography - a method developed by pharmacist Julius Neubronner nearly a century ago as a way of capturing aerial photographs. This method was used mainly for military purposes during World War I in the field of what would nowadays be called ‘unmanned reconnaissance’, a precursor of modern drone warfare. This background reflects in the context of CENTRE VIEW – the second element of KINGDOM COME. The monitor, placed behind a net of a table tennis training machine, displays images shot by a pigeon perched on top of the German Chancellery for about 20 minutes, nearby the demonstration. The method of reconnaissance is ironically folded back against the state and its historical continuity. The bird deterrent system on the Chancellery’s roof seemingly has no effect, in fact becoming one of the main subjects filmed by the pigeon. The sovereign power concealed behind the obscure transparency of the democratic order – as displayed in RITUALS with the state as the legitimising entity under which citizens are permitted to protest – finds a twisted reprise in CENTRE VIEW. Firstly, the state’s laws do not affect the movement of the pigeon, nor its reconnaissance activity, secondly the installation of the piece actually mirrors the hierarchy of democratic order if we think of an art installation as the artists’ definition of a specific space and its modalities – a law, if you will. The meshed net obstructing the view of the monitor keeps the viewer in motion as they continually seek a better perspective. 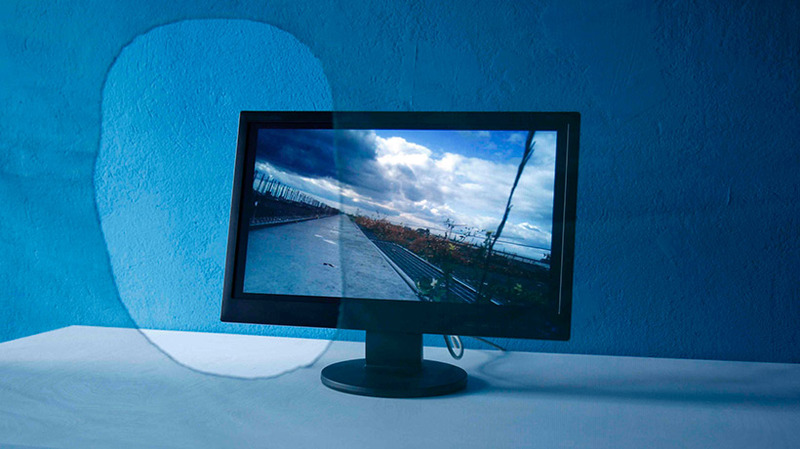 In front of the monitor there is a single hole, making it possible for one person at a time to have an unobstructed view of the video, albeit in an uncomfortable position. The artists’ ‘sovereign installation’ therefore shifts the attention to the exhibition space and initiates reflection on the accidental community the art spectators build. In this case the consumption of art can no longer be seen as a private, individual experience but as a collective encounter. 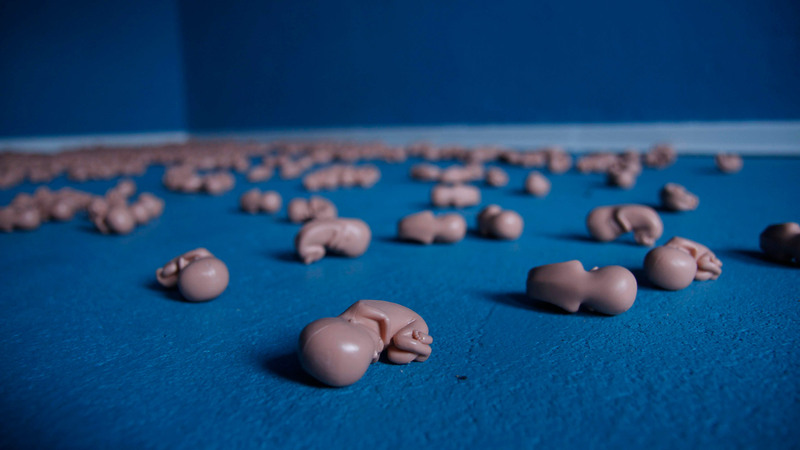 INTERNAL MARKET: The third element of the installation is an arrangement of one thousand 2’3 inch (6 cm) plastic fetuses that the artists have obtained under dubious circumstances. The piece discusses the overlapping of biopolitical agendas and salvation phantasies, both within the interests of state and religious groups. The one thousand white and identical plastic fetuses bear the marks of mass production and introduce the individual as a commodified being. Life production – as discussed in Silvia Federici’s ‘Caliban and the Witch’ as capitalism’s need for steady reproduction of labour power and consumers at the same time – displays both unpaid reproductive labour itself and its outcome as the basis of the ongoing of an economic system. In INTERNAL MARKET the marks of fordist production are visibly inscribed onto the future post-fordist subject.